If you control a Town, you may purchase Units from it at this time. Different units are available based on the Town’s Level. When new towns are placed, they begin at Level 1. Their marker is placed as indicated in the diagram to the right. If you controlled this town, and it was Level 1, you could buy Bandits or Orcs from it on your Purchase Sequence. If it was Level 2, you could buy Medusas as well as Orcs & Bandits. At Level 3, it would be able to sell you Efreeti, Medusa’s, Orcs, and Bandits. While at Level 4, it would make available Black Dragons, Efreeti, Medusas, and of course, Orcs & Bandits. To purchase units, take the desired Unit Card from your hand (or Adventure Stack) and place it under the Town Card. Then you would discard a number of cards equal to the Unit’s Card Cost. The Card Cost of a Unit is in the black box on the top right of the Unit Card. See the diagram of the Orc Unit Card on page 5. If you wish to raise the level of a Town Card that you control, you may also do this on your Purchase Sequence. Simply discard a number of cards equal to the Town’s Level +1. For instance, if you wish to upgrade a Level 1 Town to a Level 2 Town, you must discard 2 cards. If you wish to upgrade a Level 2 Town Card to Level 3, you must discard 3 cards, and so on. Each Town can only be upgraded once per turn. When it is upgraded, move its marker to the space on the card that indicates its new level. Town Cards do more than produce Units. 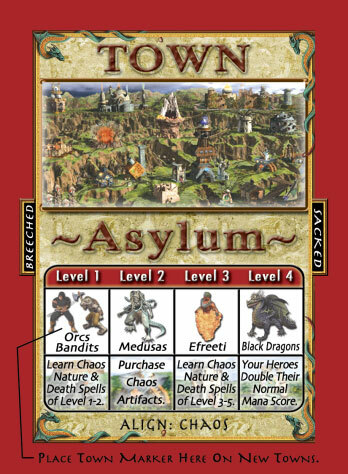 For instance, when the Town Card on the previous page is Level 1, Heroes visiting it can learn Level 1 Chaos, Nature, and Death Spells. However, if the Town is upgraded to Level 3, those same visiting Heroes learn Level 3, 4, 5 Chaos, Nature, or Death Spells. When the Town is Level 2, a Hero can purchase Artifacts of the type “Chaos” from the town. When the town is Level 4, all your Heroes double their normal Mana scores (see the “Heroes, Levels, Skills, & Spells” Section for more information about spells, skills, artifacts, and calculating your Hero’s Mana Score). If you happen to have an Army Stack in the same space as the Town Card from which you purchased units during your Purchase sequence, you have the option of placing the Unit Cards you purchased under the Town Card, or in the visiting Army Stack. If you place them in your Army Stack, they may immediately move as part of the Army Stack on the upcoming Movement Sequence.